Weigh in. Are you an A or a B? 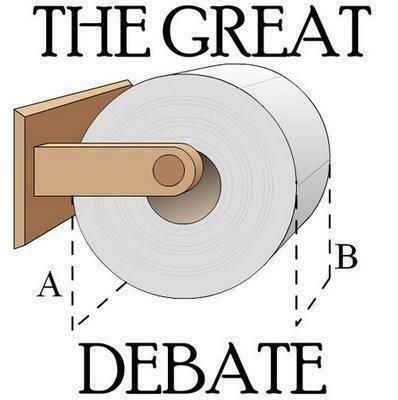 I am so far into the B category that there is a pretty good chance that I will actually (rudely) change your roll to a B if it is an A.
Oh dear, there is only one correct answer here...B! Period.end.of.story. I will change your roll to a B also. B!!!!!!! I go crazy when people do it the A way! I'm a B and I will take your paper off and make it a B if it isn't. I once read an article in the Martha Stewart magazine that told the correct way to do toilet paper and how to fold towels and I haven't strayed since. B all the way. And I've been known to fix a roll too. Of course, I never say anything to the host. I know this is weird...but, it doesn't matter to me at all. Seriously! Over, under, sitting alone in a basket...it just doesn't matter. And that REALLY doesn't go along with my OCD tendencies at all!